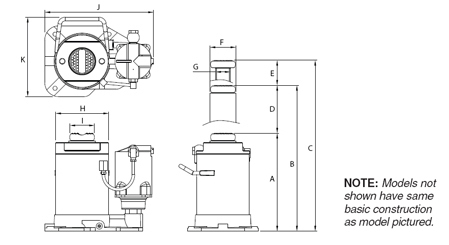 Base Size 6.625" x 8"
Convenient push button air valve connected to an in-line filter prevents contaminates from entering the air/hydraulic system. Unique design allows for manual operation when air is not available. Parkerized coating on pump piston, extension screw and extension adapters and chrome coated ram offer protection against rust. Longer wear life due to internally machined oil passages, smooth bearing surfaces and close tolerances. Safety bypass and overload systems prevent cylinder damage and prevent the jack from being used beyond the ASME/PASE load-limiting standard. INTENDED USE: For use in heavy duty trucks, farm equipment, building construction, construction and mining equipment, mobile home set-up and oil field applications.